← What Does a Good Cover Do? Is This a List of Stupid Questions? What kind of fool would ever ask this question? Would anyone be foolish enough to answer this question? Why can’t you have your cake and eat it, too? Would you like some mustard for your ice-cream sundae? For crying out loud, how else would you cry? Which way did you go, George? What do you say after you ask, “Are we there yet?” and your father replies, “Yes,” although you clearly aren’t? Do you, answer, take this question to be your lawfully wedded partner, for better or for worse, till death do you part?—that is the question. You do realize that this isn’t a yes-no question, don’t you? Does a question really need to end with a question mark. This sentence, disguised as a question, is confusing, perhaps, to you. If a bus has 28 passengers, 6 get on and 3 get off, then 4 get on and 5 get off, then 2 get on and 9 get off, and you’re doing the math right now, why didn’t you wait to find out what the question would be before you bothered? How stupid would it be to ask this question twice? What is the meaning of multiple question marks??????? Is this question really loud?!!!!!!! Will you get upset if I tell you that this question really isn’t a question? Can you believe someone actually wrote this? How many more of these questions will you read? 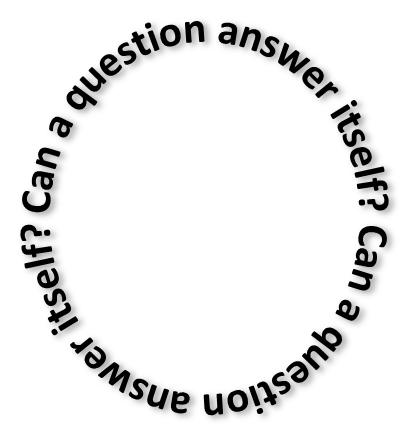 What makes a question smart? Why ask, “Who cares?” when you don’t care who cares? When will this list be over? Did you really just waste your time reading this list of stupid question? If you leave a comment, will the reply be yet another stupid question? Is this work copyrighted © 2014 by Chris McMullen? Should we throw in another question just because? I believe so, for example, “2×2=4 yes?” Teachers encourage their pupils to ask questions by stating that there is no such thing as a stupid question. Why call the question stupid when it’s really the inquirer, not the question, that may be smart or stupid? It’s not the person that may be stupid, but at most the action, since everyone is guilty of doing stupid things here and there; and we learn by making mistakes; so we shouldn’t fear asking questions, should we? I don’t know, I have heard some really dumb people ask questions. Watch any press conference and you will hear some really dumb people ask questions. Aren’t they paid to ask questions? Aren’t they paid to have some knowledge about the topic they are attempting to cover. I watched several press conferences in the past couple weeks about a issue of water contamination that has affected my community. I was almost embarrassed that some of the questions that were asked. The most absurd part was that so many of those questions were phrased so the person giving the briefing could answer with a yes/no. Or even worse, they asked the exact same question as the person before them. I do believe that an important questions must be asked and if someone has confusion, they should ask questions until they understand. But there are some really dumb people who are professional questions askers. Shouldn’t “Is this the best career path for me?” be one of them? No, you are way to smart to be a reporter. That is why you are a author.